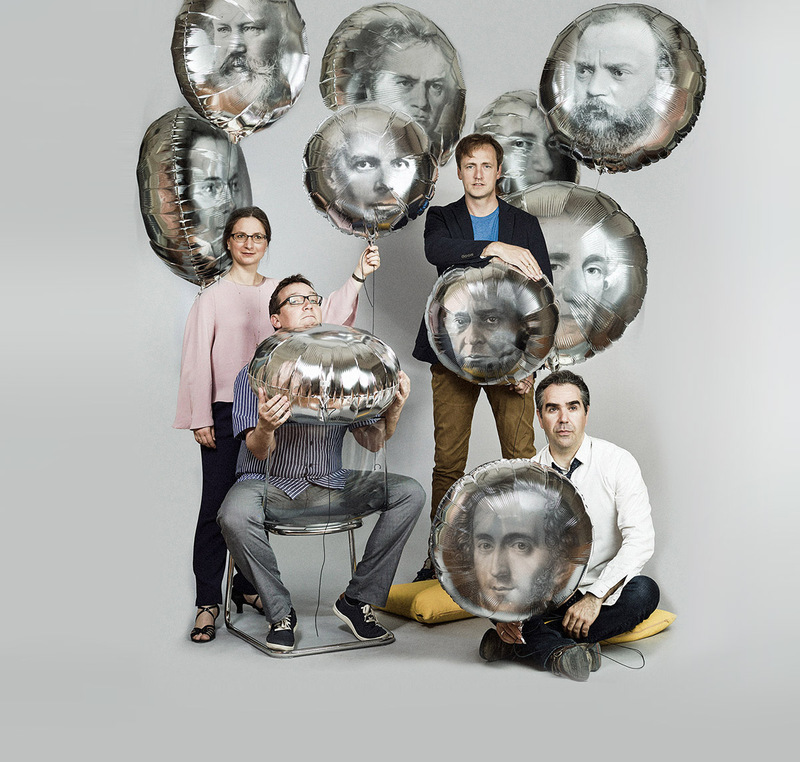 The trade­mark of the Kuss Quartet is their con­cept-based pro­gramming. With com­mon the­mes run­ning throughout their pro­gram­mes, they offer uni­que expe­ri­en­ces to accusto­med audi­en­ces and new lis­teners ali­ke. Leader Jana Kuss and Oliver Wille have been play­ing side by side for over 25 years. Together with col­leagues William Coleman and Mikayel Hakhnazaryan, they seek to vali­da­te the eter­nal “muss es sein?” of string quar­tet play­ing with their own par­ti­cu­lar brand of curio­si­ty. One such pro­ject in this vein is the col­la­bo­ra­ti­on with Nicola Hümpel, direc­tor of “Nico & the Navigators”. Their sta­ged con­cert of Beethoven’s string quar­tet Op.135 recei­ved its first per­for­mance at the Sommerliche Musiktage Hitzacker in July 2018. “Force and Freedom” in the Konzerthaus in Dortmund, the Palais des Beaux Arts in Brussels and the Radialsystem V in Berlin. The ensem­ble is cur­r­ent­ly working on a com­ple­te Beethoven quar­tet cycle, which they will per­form in chro­no­lo­gi­cal order in the Suntory Hall in Japan in 2019. Thanks to a grant from the sta­te of Lower Saxony and Musik 21, the quar­tet was able to com­mis­si­on four new works for string quar­tet from Enno Poppe, Aribert Reimann, Manfred Trojahn and Bruno Mantovani. “Freizeit”(Poppe) and “Die schö­nen Augen der Frühlingsnacht” (Reimann) recei­ved their pre­mie­res in 2016 and 2017. Trojahn’s 5th String Quartet and Mantovani’s “Beethoveniana” fol­low in 2018 and 2019. Each of the works has attrac­ted pres­ti­gious con­cert pro­mo­ters, inclu­ding Amsterdam’s Muziekgebouw, Paris Biennale, London’s Wigmore Hall and Suntory Hall in Tokyo. The Kuss Quartet was one of the first ensem­bles to bring clas­si­cal music to the club sce­ne. The “Kuss-Plus” series enjoys con­ti­nuing suc­cess in RBB (Rundfunk Berlin-Brandenburg) Kulturradio’s “Klassik Lounge”. The excep­tio­nal open­ness of the four musi­ci­ans can be seen in their bounda­ry-brea­king con­certs com­bi­ning com­po­si­ti­ons for quar­tet with works of lite­ra­tu­re. This has led to nume­rous pro­gram­mes with renow­ned actor Udo Samel and slam poet Bas Böttcher. In 2002 the Kuss Quartet was awar­ded first pri­ze by the German Music Council and in the Borciani com­pe­ti­ti­on. The fol­lo­wing year they won the Borletti-Buitoni Award and were selec­ted for the European Concert Hall Organisation’s “Rising Stars” pro­gram­me. Their per­forming care­er has taken them from New York’s Carnegie Hall, via the Philharmonie in their home city of Berlin, to all the major inter­na­tio­nal con­cert halls and fes­ti­vals. The Kuss Quartet inspi­res the next genera­ti­on of cham­ber musi­ci­ans in nume­rous inter­na­tio­nal mas­ter­clas­ses. Furthermore, both William Coleman (Salzburg) and Oliver Wille (Hannover and Birmingham) hold pro­fes­sor­ships at European con­ser­va­toires. Following the suc­cess of the album “Bridges”(Sony Classical), the high­ly-acc­lai­med CD “Theme Russe” appeared on the English label Onyx Classics in January 2012, with works and tran­scrip­ti­ons by com­po­sers inclu­ding Tchaikovsky, Stravinsky and Schnittke. In November 2013 Onyx Classics released a third disk: Schubert’s quin­tet with cel­list Miklós Perényi — a musi­ci­an with whom the quar­tet are par­ti­cu­lar­ly fond of working. Their most recent album of Schoenberg’s second quar­tet (with Mojca Erdmann), Brahms’s third quar­tet and Brahms Lieder for sopra­no and string quar­tet arran­ged espe­ci­al­ly for the ensem­ble, was released in Autumn 2016 and recei­ved enthu­si­asti­cal­ly by the press.